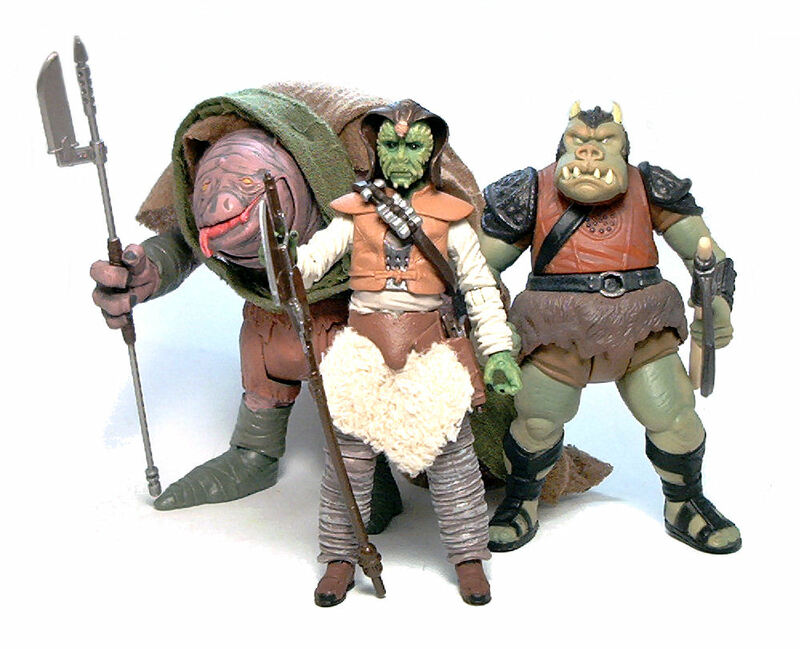 Back in the 80’s Mexican toy maker Lily-Ledy had the license to produce action figures using the same molds Kenner did. 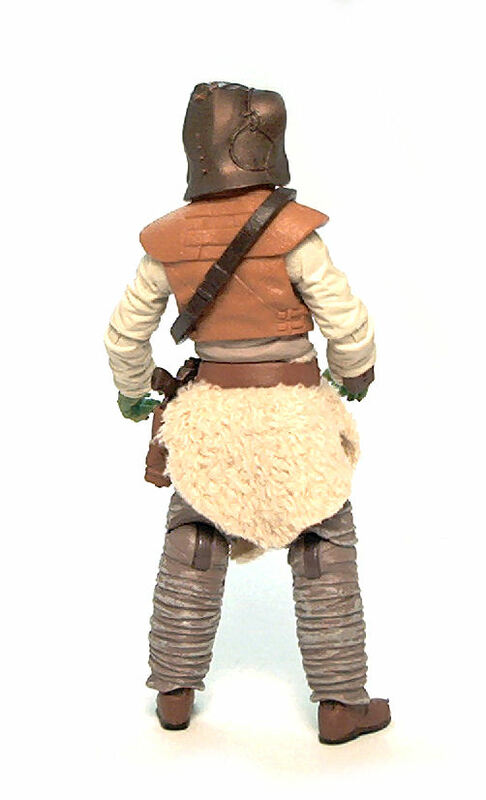 Even though the resulting figures are almost identical to Kenner’s, there are enough subtle differences in deco and materials (fabrics, mostly) to tell them apart. 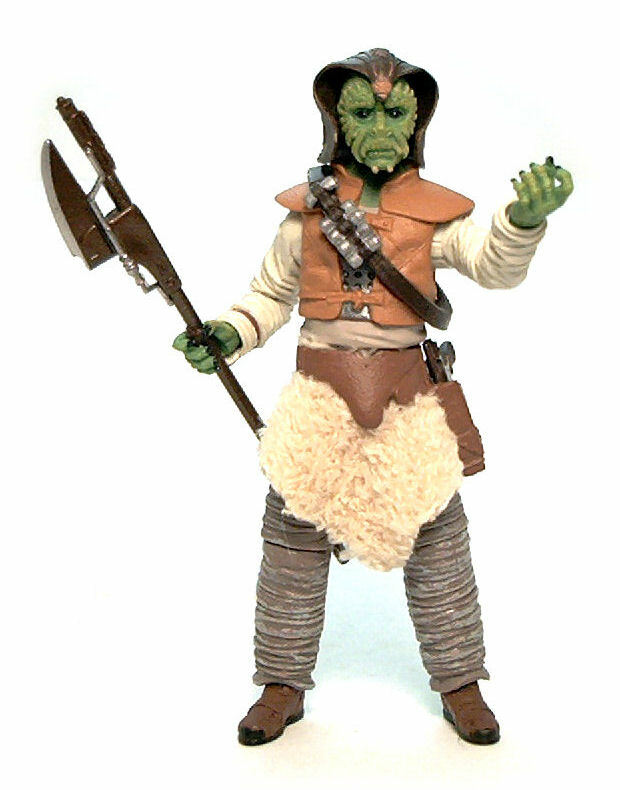 One of such figures I have is Klaatu, the cobra-headed henchman that wore a plush skirt and bought the farm while fighting off Luke Skywalker aboard Jabba’s sail barge. 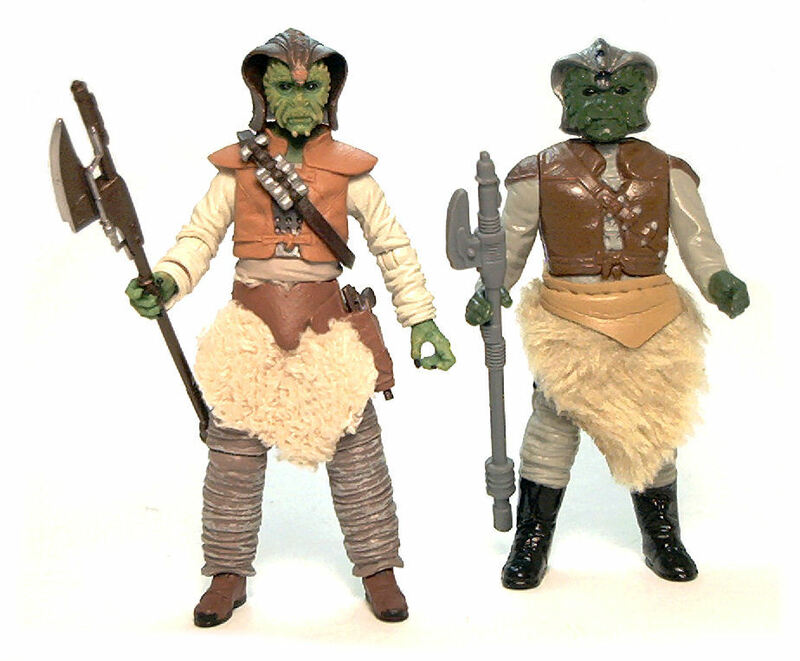 Allegedly the Klaatu figure had two variations depending on the skirt being made from actual plush or the thinner synthetic fabric used for Jedi Luke’s cloak. 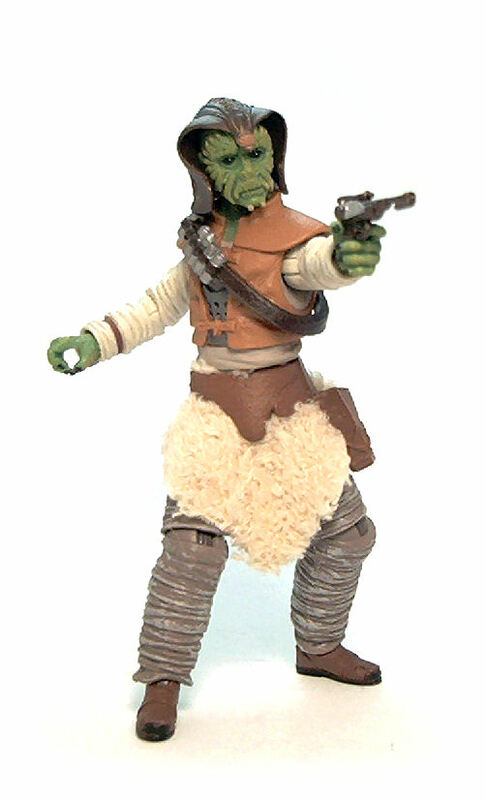 To be sincere, while most of my Star Wars figures had at some point the rather risky honor of being “My Favorite”, Klaatu was always something of an extra, the guy that would always be knocked around and end up swallowed by the couch cushions. Hence, it came as something of a surprise to find myself actually excited by the announcement of his inclusion in the third wave The Vintage Collection. You know the old phrase by Shakespeare “A rose by any other name would smell as sweet“? Well, something similar can be applied here, as even though the card states that the character’s name is officially Wooof, he’ll always be Klaatu to me. Part of my excitement came from nostalgia, pure and simple, but also from how good Giran turned out, back in the Legacy Collection. That figure really looks like a miniaturized version of the on screen costume, so I figured that in the case of Wooof we’d be getting the same head sculpt with just a new body. But it turns out I was wrong. Wooof may look very much like Giran, but they actually have unique head sculpts. The difference in the faces is not as immediately obvious as their coloring, but it’s there. From a more practical point of view, Giran has a larger neck hole than Wooof, so head swapping would not have been even possible. Wooof’s attire is extremely well done and matches perfectly the on-screen look of the costume. The greater improvement is the richer color palette and the layered feel to the clothes. 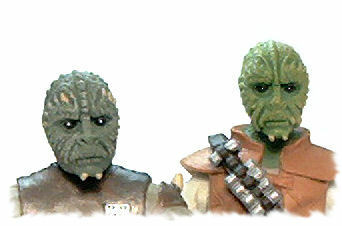 Klaatu’s skullcap is removable, as well as the bandolier across his chest. The skirt is made from a very thin plush fabric that is the perfect color to simulate bleached lamb hide. Of course, some costume elements do get a little in the way of some of the joints, like the left leg holster, but there are really no big issues anywhere else. As far as weapons go this alien thug comes with all the tools of his trade. First off, he has a modern version of the force halberd he carried in the vintage days. The weapon is the same exact mold used for Giran but the deco is slightly improved with a shinier blade and a bronzer plastic color. Next is one of those ornate blaster pistols Jabba’s thugs used to carry. Again, the weapon is a reuse of the one seen before on another Legacy figure, Nikto Gunner Nysad, and like the halberd, it has an improved deco. The paintjob on Wooof is excellent, with practically no slop or stray paint splotches. The face color might be a little too bright and could probably use darker shading but the overall effect is remarkably lifelike in person. 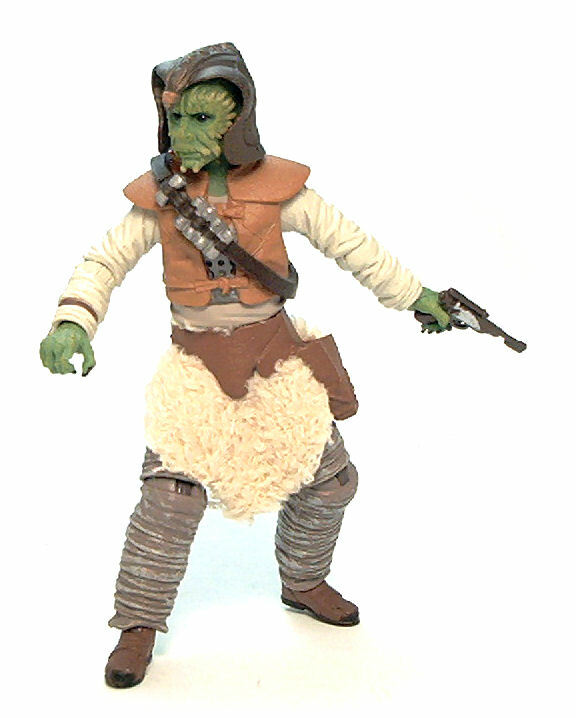 Overall this is a mighty fine figure to have and a much-needed update on one of the more prominent aliens seen at Jabba’s den. The bare head reminds me a bit of the alien from Last Starfighter. Possibly the Jem Hadar from DS9? Close enough. They even have the face spikes. Good eye ;)!